KANSAS CITY, Mo. -- Here are some Tax Day deals to help you spend some of that sweet, sweet refund coming your way! And if you're not getting a refund this year, well then here are some ways to save and even a few freebies! Either way, check out these deals. Applebee's - Dollaritas! Applebee's is offering $1 strawberry margaritas through April 30. Dunkin - DD Perks loyalty members can score a medium hot or iced coffee for $1 Monday. 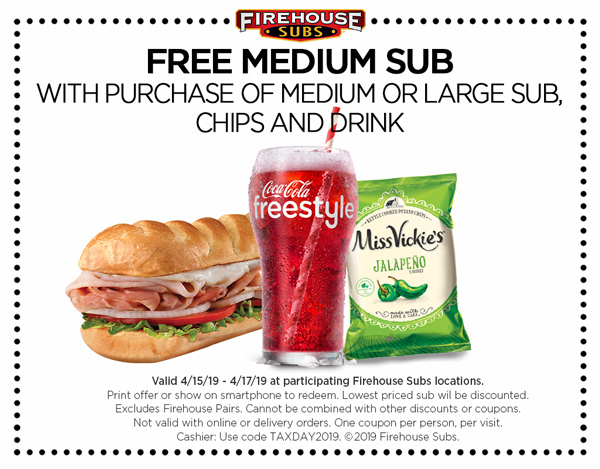 Firehouse Subs – Firehouse Subs is inviting guests to stop by to receive a free medium sub when they purchase a full price medium or large sub, chips and a drink (valid Monday, April 15 through Wednesday, April 17, 2019). Please click here for a link to the offer. Free Hydromassage - Available through April 20, at Planet Fitness gyms (There are several locations in the KC metro and you don't have to be a gym member get the massage). Call or visit the website to sign up. You can visit Hydromassage.com/taxday to find the nearest location to you. Great American Cookie Company – The Great American Cookie Company continues its annual Tax Day tradition by offering a free chocolate chip cookie to customers who stop by participating stores on April 15. Limit one per customer, while supplies last. 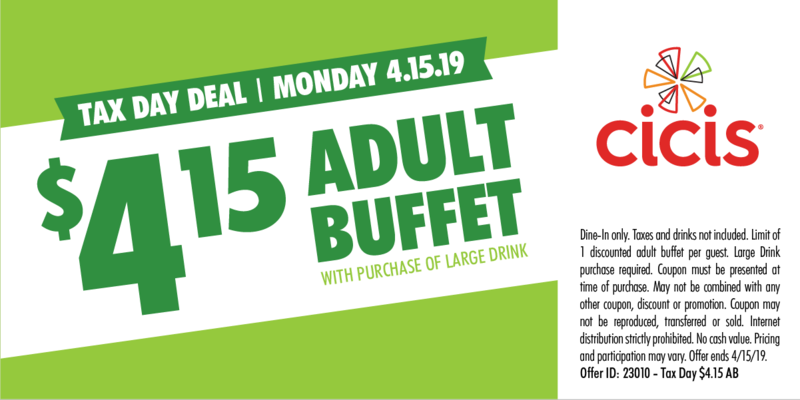 Hardee's - Customers who say "made from scratch" can score a free sausage biscuit from 7 to 10 a.m.
Hooters - Through Monday, kids 12 and younger get a free kids meal with an adult purchase of $15 or more at participating locations. Kona Ice - Free shaved ice from 1-3 p.m. in front of Crown Center. McDonalds - All day Monday they're offering buy one Big Mac, get one for 50 cents if you use the coupon in the mobile app. Noodles & Co. - $4 off your $10-order for all Noodles REWARDS members. Office Depot - Up to 5 lb. of free shredding with coupon. Offer available through April 27. PF Changs – PF Changs is offering $10 off your online order of $50 or more with the code TENOFF. The deal is valid through Sunday, April 21. Pizza Hut - Any large two-topping pizza for $5.99 if you order online and carry out. Potbelly Sandwich Shop - Just mention that it's Tax Day and you can get a buy-one-get-one free entrée. Red Robin - Red Robin Royalty members are eligible for daily deals with a $10 or more purchase. The deals run through Sunday, April 21. Smoothie King - $2 off any 20-ounce smoothie Monday through Thursday with the app. All offers available at participating locations.